Raise your hand if you dread laundry day. Or if the thought of scrubbing your bathtub makes you feel anxious. When you have osteoarthritis or inflammatory arthritis, the daily and weekly chores everyone finds annoying can feel even more burdensome, and in some cases, near impossible. 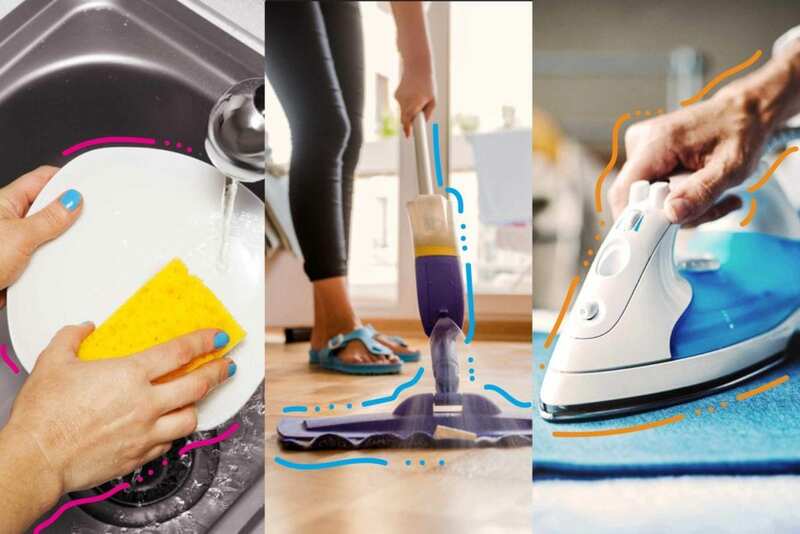 Here, we asked Dodge for her best trade secrets and polled our CreakyJoints Facebook community for advice on how to make household chores less of a hassle for people with arthritis. “When it comes to any household chore, create a plan by writing down everything you need to do in a week and then spread it out in a realistic manner,” says Dodge, who treats patients and oversees occupational therapy outpatient clinics at the University of Michigan Health System. For example, if you usually need to do four loads of laundry a week, break it up so you do about a load every other day. Doing the same activity for a long stretch of time — say, vacuuming your entire house — isn’t a joint-friendly way to approach cleaning. It forces you to use the same joints and muscles over and over, which can increase discomfort and pain. Instead, break down tasks and intersperse them with others. So maybe you vacuum one room, then empty your dishwasher, then vacuum another room, then fold a pile of laundry. That’s a strategy that Kay Boucker finds useful: “Break [tasks] down into bite-size chunks and take micro rests,” she says. This might sound counterintuitive, but you’re better off cleaning a little bit every day or so than letting things build up, says Dodge. Wiping down your kitchen counters every day takes less effort — and puts less strain on your joints — than having to scrub away dried-up gunk and grime that’s accumulated over a few days. “I do laundry as it accumulates and take care of it as soon as it comes out of the dryer so I am not faced with mounds of laundry,” says Ivanna Schunk. Patient Tegan Bonham coins this helpful approach “interval cleaning.” She’ll use the few minutes while waiting for the tea kettle to boil or the microwave to heat something up to do something useful like emptying the dishwasher. “While watching the kids in the bath, take a few minutes to wipe down the counter or clean the mirror,” she suggests. “Buy tools to ease the burden,” recommends arthritis patient Nancy Hopper Matthews. Dodge agrees; she’s seen people who’ve switched to using a Roomba vacuum, which cleans your house on its own, and loved it. Lightweight mops and vacuum cleaners are a smart splurge because they will be less heavy to drag from room to room. Get cleaning brushes with long handles (like this one or this one) so you don’t need to bend over as much. “Find something with a long arm for cleaning the tub so you don’t have to get on your knees and crouch over,” says Stephanie Darrow. Another tip: Don’t do a laundry load of all large heavy things, such as towels; rather mix a towel or two into loads of lighter items. “Thank goodness for office chairs,” says Nancy Kaplan. She uses one as a makeshift pushcart around her apartment. On laundry days, for example she sets the basket on the chair to transport it to and from the laundry room. If you live in a place with an upstairs and downstairs, create two sets of cleaning products so you don’t have to drag your most commonly used items from floor to floor. Claire Cotton even got a second vacuum so she keeps one upstairs and the other downstairs. Believe it or not, some household chores may actually help your arthritis feel better. “I do dishes a lot as the hot water feels wonderful on my hands,” says Debra Meilahn. “Listen to great music to distract your mind from pain or frustration,” suggests Kay Boucker. Embrace your inner Marie Kondo and ditch household items that no longer work for your arthritis lifestyle. Nancy Kaplan replaced her ceramic dishes with melamine ones — “I needed lighter dishes that could handle sliding out of my hands.” Gwenne McCarter ditched heavy cast iron pans and pyrex dishes.